Is North Korea testing new rocket engines? North Korea appears to be moving ahead with efforts to improve and possibly modernize its long-range rocket capabilities, according to an analysis of new satellite photos. Engine tests for the North's long-range rocket program appear to have taken place in late March or early April of this year, analysts at 38 North, a blog run by the School of Advanced International Studies at Johns Hopkins University, have concluded. "They conducted at least one test of an engine for a long-range rocket, and there may have been more," says Joel Wit, a former State Department official who manages the blog and studied the images. 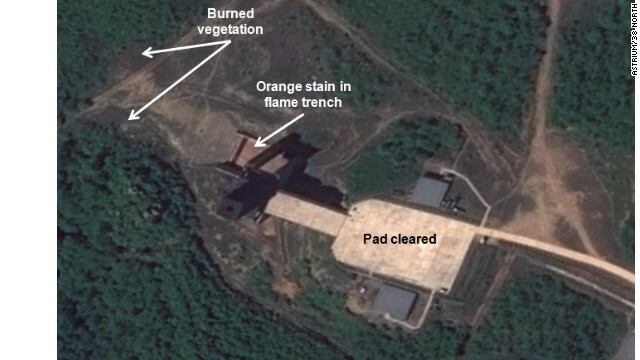 Over the course of several weeks, the images show the appearance of possible fuel tanks, burned vegetation and a seven-car train parked near the rocket assembly building that might have been used to transport equipment and propellants to the test site. The site of the latest testing also appears to be the same site from where a long-range rocket successfully launched a satellite into orbit in December. A similar test launch from the same site in April 2012 was deemed to be a failure. While another test of a long-range rocket does not appear to be imminent, the North still faces a wide range of international sanctions for a program many feel might be a cover to develop long-range ballistic missiles capable of reaching vast distances. Wit says the latest activity could possibly mean the North got enough data and experience from the most previous launches and could afford to focus on other aspects of the program instead of rushing to another test launch. He stressed it is never certain what the current motives of the regime are. "It's not a full-up test, like what happened in December or April, but it's part of that process and its one that doesn't get a lot of attention from the outside world either," he said. Of course they are! They think having a missile that could hit America is everything they need. They will be successful too. That's why we are building our shield. north korea should shove a nuke up usa and britains a s s let the irish ghanaian potato farmers from dublin halfbreeds get blown sky high . Hey Saeed. Do us all a favor and go blow yourself up in Yemen or something. Your wasting good oxygen please stop. This guy is proof that an I.Q. score can, in fact, be a negative number. is US not doing the same ? Looks like South Korea is going to accept to feed them more.. to "officially" save Canada from NK nuclear missiles. Unplug everything and let them starve. Let the NK army continue what the y do the best.. fishing and crabbing to feed themselves. North Korea has never developed a weapon they have not sold. They don't really have fear of the south or a new US invasion. This is to make money. Their nuclear tests are marketing tools to foreign governments, and rockets are a value add for their product. There has been a great migration of fish off the coast of North Korea. Every fish within 25 miles of the coast has migrated out of range of North Kore's missles and have swum 26 miles from the North Korean mainland. Korea has never done anything to us, so I say let them test engines in their own country. It's not like America, which blew up nuclear weapons in about 30 nations waters to test. 30 nations? Really? Beside lying, what else can you do? I bet you're not able to list all nuclear sites used by the US. AWH, here we go again. That little imp will start screaming and throwing tantrums of threats once again. Again he will want Obama to call him to sooth him and offer him oil and rice. Unfortunately, Obama, being the momma that he is, will give in and give it too him, just to shut him up and get nothing in return but peace and quiet. Obama will not give in like you state and he did not make any call to Korea the first time which shows your facts are clearly wrong. It is also painfully clear to see that you really have no clue on how world affairs or diplomacy works. Your right he didn't that's why he had kerry do it for him. Mob mentality keep your hands clean and let the minions do the job. @usmc1371,yes let Pres.Obamas people in that State Dept with Kerry handle it with diplomacy something most republican presidents never were able to do properly right marine...Bush would've tripped over his tongue again and started another useless,senseless war and hey marine you might get called back to active duty in some God forsaken hell hole just like you wanted to fight in for something you have no idea what's its all about like oil right!! Thank goodness for the "Pad Cleared" label affixed to the empty pad. I would have otherwised reached the conclusion they were testing an invisible missile. It's a rocket engine test stand used for static fire testing of just an engine not an entire missile. I'm not sure what the pad is for or it's significance. But the lack of any vehicles on the pad would be a possible indication there isn't any activities going on currently. I would love to see Europe or anyone else besides the US stop government genocides from occurring all over the world. Look at the history of our "policing" and you'll see we've saved millions of lives. You idiots can't look past your own nose. If any other country had the balls to do what we do, we wouldn't have to sacrifice our people to save everyone's asses. The image of some of our NATO "allies" who RAN OUT OF AMMUNITION during the minor conflict with Kadaffy shows how weak and dependent they have become. Many of the troops of these countries do best at ceremonial parades where they can wear their brightly colored uniforms with shiney buttons, gold braid and knee length shiney boots. North Korea is a pain in the worlds A– an we all know it, really what can they do to us the USA not much. What we really need to do is build a China like wall 360 degrees around North Korea an let them alone let them kill each other off. If by chance NK nukes some one then it will be time to pull there plug an let them go down the drain hole of history NO MORE NK. Just in time to put Iran nukes on them !!! A description of the rocket has been leaked. Described as new advanced rocket, it has a very large cylinder attached to the top of a very tall telephone pole that is painted bright red and has a green rope coming out the bottom of it. There are also rumors that the North Koreans are working on a "Worlds Largest Cigarette Lighter" project to get into the Guinness Book of world records. United States shot off a missile last week and tried to shoot it down, but failed. No one except the United States can do this. I think the UN should put sanctions on the United States. Just ask that basketball guy with all the tattoos. He'll set the story straight. America tests weapons regularly and MURDERS much more people all over the world with them, often CIVILIANS! Why is it North Korea that shown up on the news? I KNOW EXACTLY what I am talking about although it may not be immediately visible from people brainwashed by the government propaganda! Its because America owns the most marketed global news media companies and Hollywood. They use movies to make others look like bad guys since the beginning of Televisions existance. With years of big corporations and governments influence, most people are hypnotized to support or agree to what ever the the government tells the news media companies to say. Poor North Korea !! All they have to brainwash their people with is murder, torture, life imprisonment and starvation. It is Very Clear you have no idea what you talking about you are brain washed with conspiracy theories! "Think", some Americans are actually intelligent enough to know that Korea has never harmed anyone, but the US has detonated Nuclear Weapons in over 30 nations. Learn to read some time. You might be especially interested in the chapters about US underwater nuclear tests in the South Pacific. Sly last time I checked the last nuclear test in the Pacific was in the 1960's which is very irrelevant to the present. I am very aware what I am talking about I have a PhD in History and Polotics I have probably read and wrote more articles then you can comprehend. are you considering the fact that civilians have NO HUMAN RIGHTS? say somthing bad about there midget prsident , and you get life in jail! listen to south korean radio life in jail , think before you speak, you dont know what you are talking about, go live in NK and let us know how you like it, IDIOT! Have you ever seen a North Korean political prison where whole families consisting of three (3) generations are confined to slave away their entire lives in misery and degradation for some minor or imagined crime? Please meet with North Korean defectors to hear their life stories. Well they did open the trade center with S. Korea it is possible that they purchased a used Hyundai and are planning to power a rocket with the engine from one of those. Why don't we just bomb them and get it over with? Because we will be the aggressor, right? Why wait until they CAN nuke us so that we will have limited options in our reply? Isn't it time we shut this frat-boy wannabee up once and for all? Maybe because we used our resources to bomb Iraq- which had no WMDs, while leaving North Korea, alone. Colin Powell at the UN. Anybody remember that dog and pony show?? This picture, what does it prove? Where is it? Who cares anyway. That's why they suddenly want to talk. Remember when this guy was considered a threat? Me neither. It's only a matter of time before the south and the north go to war. The only thing stopping it now is ( we wont mind our business ). We would have to get involved because the United States and South Korea have a mutual defense treaty. The US is just waiting until they can actually do damage here before we stop it. Something about making it fair. Exactly. We should publicize what's going on here in America, because these are GREAT times. President Obama killed America's #1 enemy of all time. Our stock market is at a new all time high heading towards 20,000. We have strong health care reform, and immigration reform is coming soon. We've made it legal for couples of different races to marry, and eliminated government discrimination againest gays. Best of all – NO major foreign terrorist attacks under our strong President. Where you get your kush? I need some of that your in a fairytale. @Nancy,yah with no help from those ignorent,racist republicans no less..One minute they're against immigration now they're for it,against cutting loan rates for college student loans now for it..Typical delushional ,uninformed ignorents just like those who comment on here and you know who you are kiddies and in denile as well! !Can't wait till midterms,can you say goodbye republicans ,I can!! Explain to me why more people are on food stamps and living on welfare? Could it be because those making money on the stock market are those evil 1%? Why did the dow drop so much with just a comment about cutting the billions of government funding? Why did the dems not scream when Obama gave those big bad business a waver on meeting the mandates of the new law but not individuals? Keep your head in the sand if you want. @USMC1371,tell me marine why then are the republicans screaming foul about cutting funding for the MIC when they were for it during the sequester negotiations.When republicans almost voted unanimously for the sequester thinking that Romney would win in the election and they could step in and change the defense cuts in the sequester afterward but marine Romney lost and now like everything else republicans touch it all goes to hell in a hand basket doesn't it! !Remember bud its democrates in Roosevelt that help create SocialSecurity and LBJ that helped create Medicare but all I remember republicans creating was the Great Depression by Hoover also straightened out in 12 years by democrate Roosevelt and now the Great Recession created by your imbecilic hero from Texas in Bush being fixed by democrate Pres.Obama..We democrates build this country up only to have republicans knock it down,check your history bud as republicans in presidents have either created or got us into more wars than democrates ,another known fact and if Bushs were president today I'd say we'd probibly be in another war in Syria,Egypt or God knows where else .You'd be the boots on the ground again fighting for something,someone you know nothing about as usual right marine.Just like in Vietnam,Iraq or Afghanistan,you think about it marine all useless,senseless wars all manned by American forces that should of never as usual been there!! !Americas insistence in meddling in other countrys businesses internationally makes us our own worse enemy,think about that if you can still lace up your own boots marine!! @pery,if immigrations illegal bud how the hell did your relatives get here and are you one of those REGULAR PEOPLE WE READ ABOUT...And I'm advocating peace bud get your head out of your nether regions,read much ,obviously not! !You must not be too smart either because if you understood what I wrote you'd agree but again the catch word with you is SMART,NOT! !